I’ve had the banner on this blog’s sidebar for a couple of weeks now — just what is a FanstRAvaganza 3, you ask? 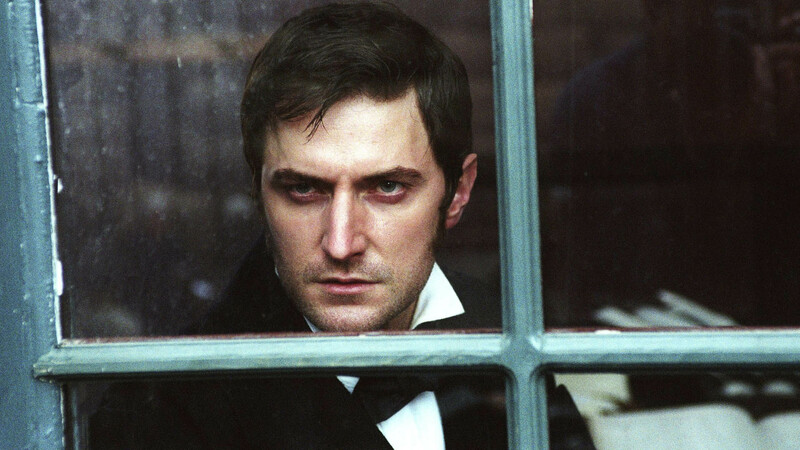 It’s the combined efforts of 34 different bloggers to celebrate the talents of a British actor you may not know, but you should: Richard Armitage. 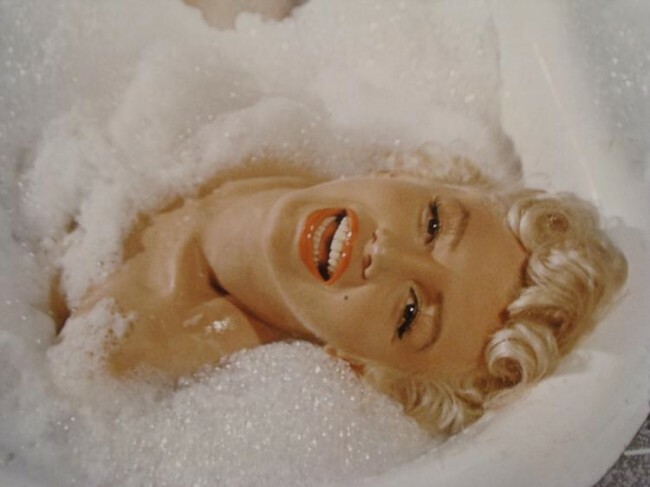 Perhaps you’re saying to yourself, now there’s a nice bit of eye candy. 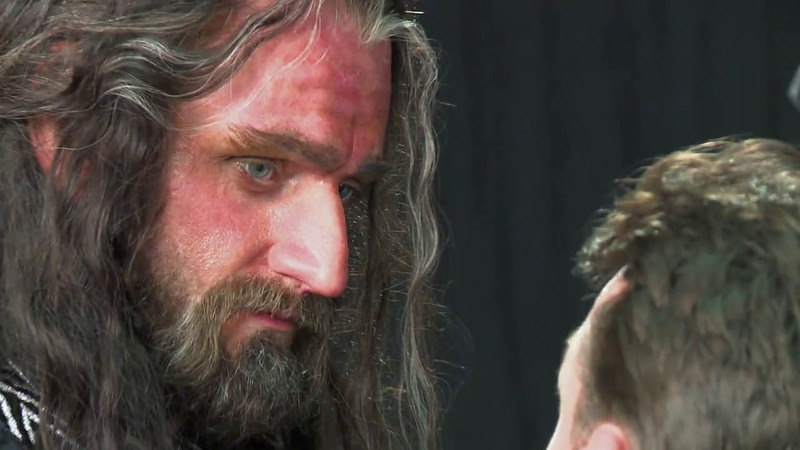 You’ll be forgiven by the bloggers participating in this blogfest, who know perfectly well that one of Armitage’s great gifts is looking good. Just don’t underestimate his acting skills. 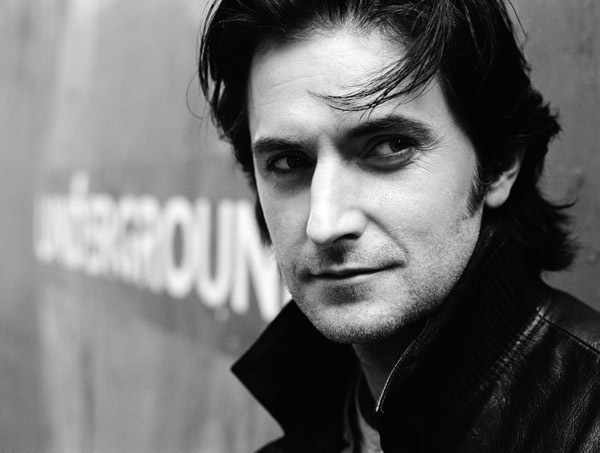 I know him best from North and South (stay tuned for more on that subject), but he also starred as Guy of Gisborne in the British TV series Robin Hood, Lucas North in Spooks (series 7 & 8), and John Porter in Strike Back; he’ll appear as Thorin Oakenshield in the forthcoming The Hobbit films. Blogfest organizers have found a way to do something quite innovative (and organizationally complicated): each post will link to another post via what they’re calling a tag-team, allowing readers to move through shared ideas from blog to blog, almost as if they’re conversations about a theme or a performance. Because, of course, it’s intended to be a conversation: a way for 34 different writers and their many readers to chime in and think about these topics. What a terrific idea, and what a nicely democratic way to get everyone talking to everyone else. 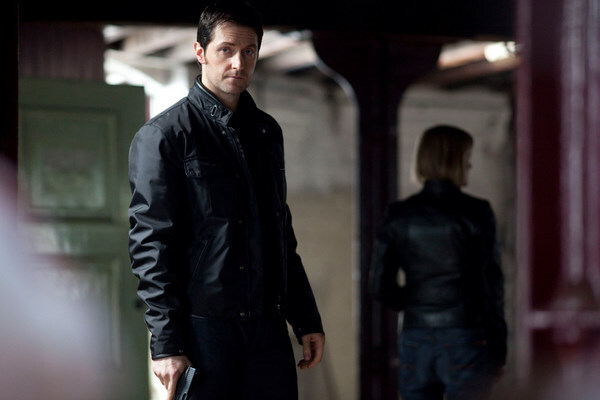 Maybe the whole idea a fan-oriented blogfest makes you want to vomit: maybe you’ve never heard of Armitage, or you look down your nose at fan blogs. Again, let me suggest you pop in on this one anyway, because these writers run the gamut of great weblog philosophizing. They might admire his shoulders in one sentence and ponder the nature of objectification in the next; sing the praises of his sensitivity in a scene and then think about why the dynamics of that particular scene might speak so profoundly to a viewer dealing with the crap and trauma that life throws at us. 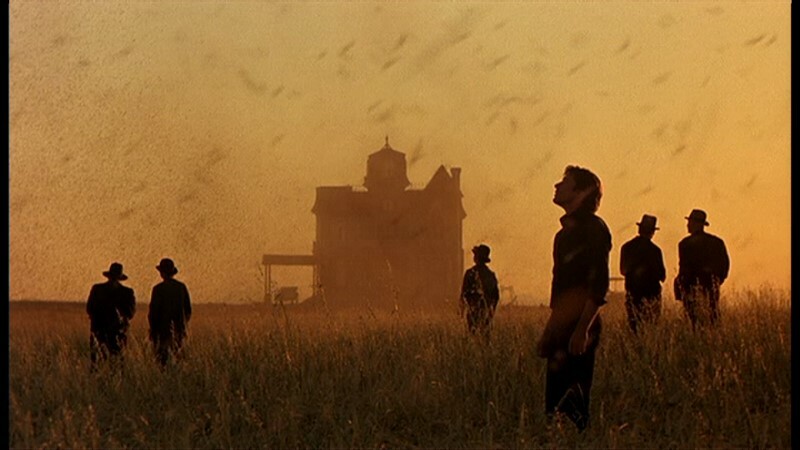 Readers of this blog know that’s my own impulse as a writer: the personal is political, and the filmic is both personal and political. Starting March 12, the following bloggers will start tag-teaming and conversing — join me in the chat, won’t you? He first appears in the dream-world of the weaving floor. His posture is impeccable. 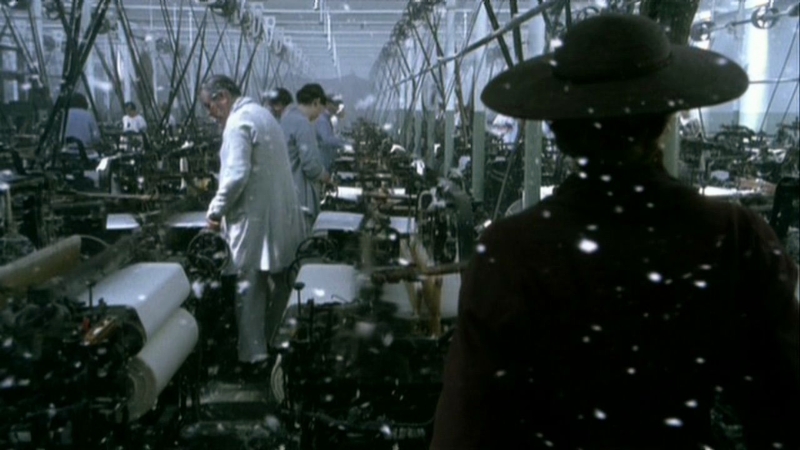 Whereas the wage workers have bits of cotton fluff sticking like snow to their hair, eyelashes, (lungs) and clothing, Mr. Thornton’s black hair, black suit, and black tie appear untouched. You hardly have time to think, now that’s a fine-looking man, because within seconds he will race down from his perch and brutally beat the worker he catches trying to light a pipe. Did I say brutally? I should say savagely. What are we to do with such a man? 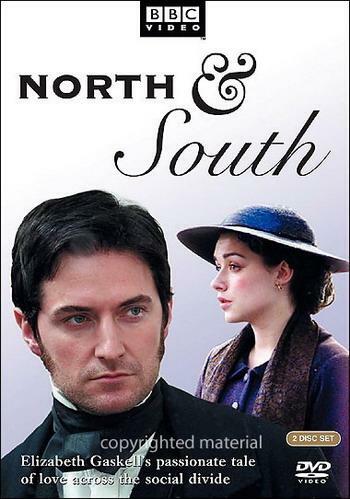 You’d be forgiven if at first you mistake North and South for a ramped-up (and less witty) Pride and Prejudice. 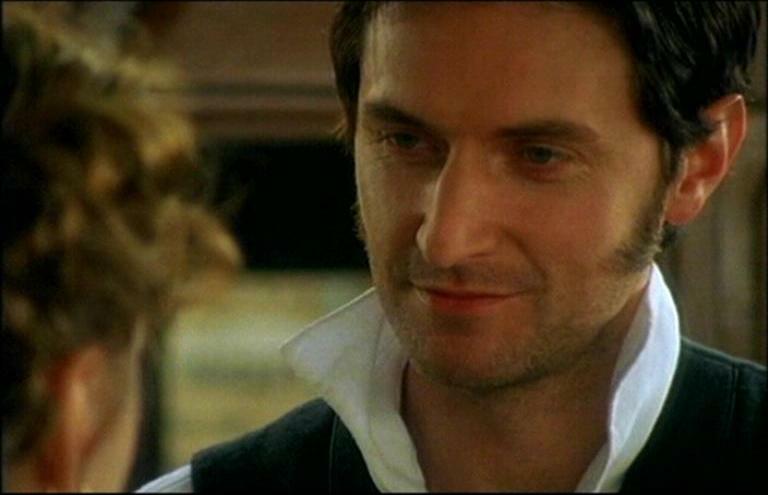 The contrast of temperaments, regions, and classes between nouveau pauvre Margaret Hale (Daniela Denby-Ashe) and nouveau riche John Thornton (Richard Armitage) proves more obstacle than frisson of potential love. 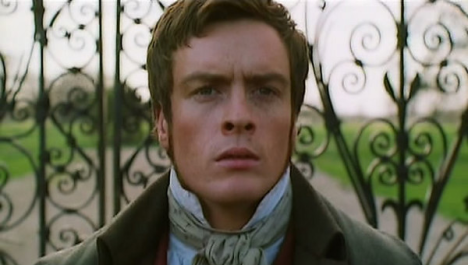 Yes, they are beset by problems of pride and prejudice — but this series is far more concerned with the real-life costs of industrial and financial change, making P&P appear much more a never-never land outside of history. 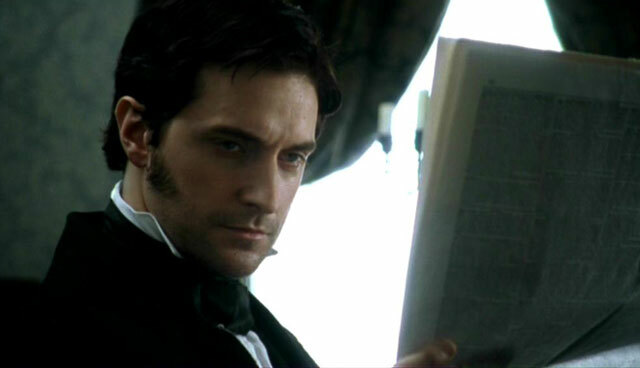 No one could have done a better Thornton than Richard Armitage — and in the spirit of my Dear Friend (and after being assured she had not already covered the subject) I’d like to indulge here in a close reading of Thornton’s language of clothes. 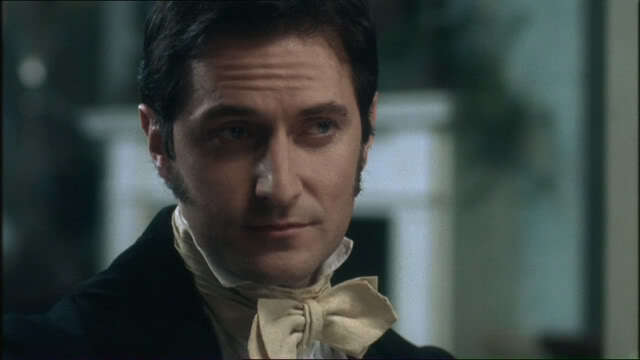 Even the most casual viewer will have noticed, even if only subconsciously, the way Thornton’s high starched collars, long frock coats, and, especially, the wrapped-around neckties help to cement our image of him as a man who feels acutely his responsibilities, a need for control over the business. I think his clothes do more — and they beg (beg, I tell you!) for analysis. 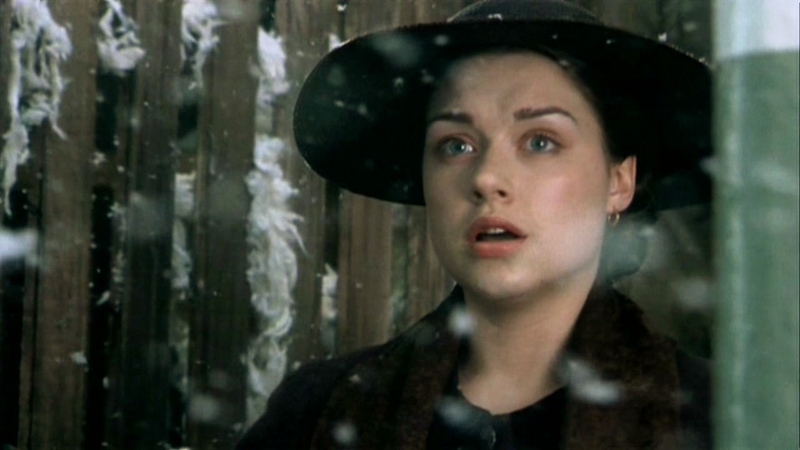 Thornton: Don’t worry, Mother — I’m in no danger from Miss Hale. She’s very unlikely to consider me a catch. 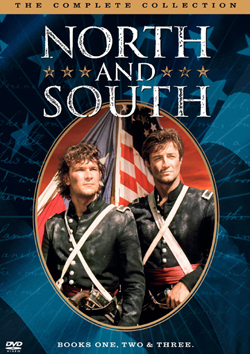 She’s from the South — she doesn’t care for our Northern ways. 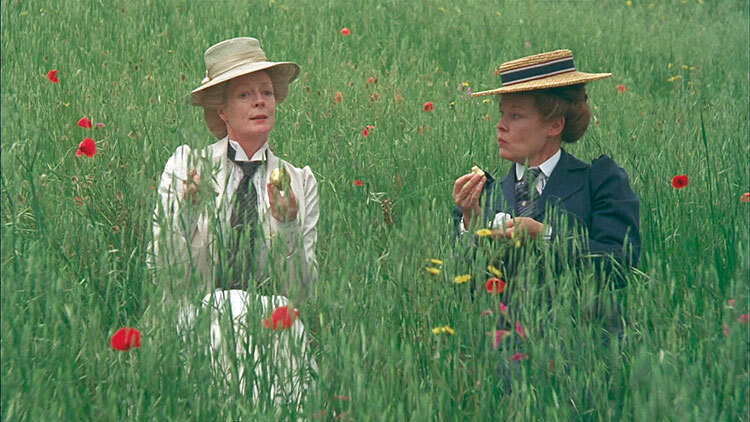 Mrs. Thornton: Airs and graces. What business has she? 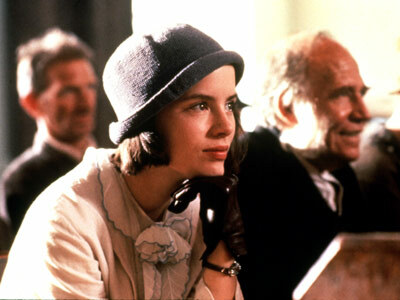 A renegade clergyman’s daughter — who’s only fit to give useless lectures to those who have no wish to hear them. What right has she to turn up her nose at you? Personally, my favorite tie is the ivory linen one he wears at dinner, again chez Thornton, looking the contented domestic man, perhaps because of his growing thought that Margaret might eventually stand by his side: And let’s pause here on the complex semiotics of ties. More varied than in later eras, the 1850s neckties Thornton wears are wound two or three times around the neck, making the neck appear fuller especially at the throat. Even during a pre-Freudian age, variations on the knot had strong sexual connotations, as this slightly tongue-in-cheek illustrated 1818 sheet shows us. (One version here is called the trone d’amour for “its resemblance to the Seat of Love” — i.e., women’s genitalia — and the author advises that when utilizing that style, one should choose a fabric in the color of “a young girl’s eyes in ecstasy.” Note: click on the image to get a much clearer view of the details.) See also the 1828 Art of Tying the Cravat (which on Google Books sadly lacks the illustrations). Even if they didn’t always serve as a code for rakish men’s sexual proclivities, ties were well-regarded as bearing a relationship to the throat, the voice, creativity, and one’s temper. 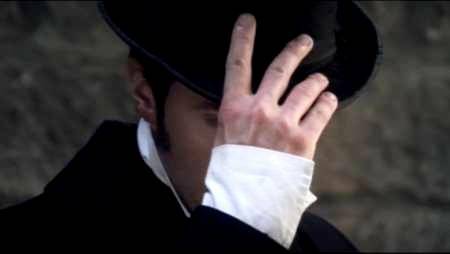 “A tight cravat will cramp the imagination,” Lord Byron believed; singers carefully wrapped their throats to protect their voices. Positioning Thornton in tie after tie evokes in our minds a man torn between self-control and temperamental rages because it brings our eyes back, again and again, to his throat — that narrow channel where sustenance goes down yet where bile can bubble up; where the voice can be modulated or let loose. Not to get all anachronistically Eastern on you, but I can’t help but think about yogis’ views of the throat chakra. 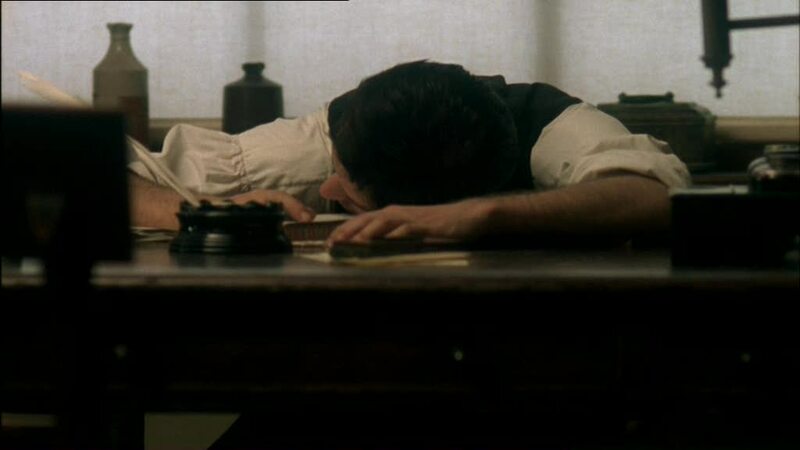 All of which brings me, obviously, to that rare moment after the riot, after Margaret has been struck by Boucher’s rock and has left the Thornton’s to return home. It’s a crucial moment for Thornton: he’s been juggling the police, his Irish scab laborers, an angry mob of Union workers, and serious financial concerns, and meanwhile his mind is still swimming after Margaret rushed down to try to protect him. Suddenly he appears at his mother’s side without tie and with his shirt open just at the top — all of which shows how vulnerable he is, how much in love he’s fallen. 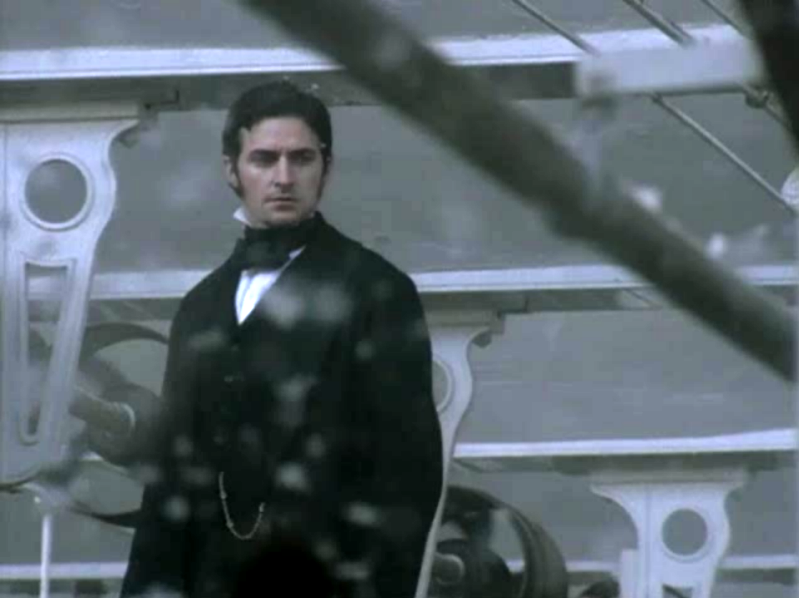 Of course at this moment his voice here cannot be impeded by a tie; he steps away from all those competing problems, and with the safety of only his mother close by, he abandons his carefully-won propriety and self-control to admit his feelings. 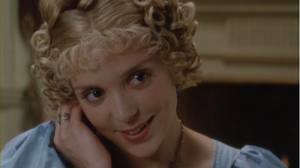 Mrs. Thornton begs him not to go to Margaret’s, but she also persuades him that Margaret’s actions have effectively declared her love for him. He’s skeptical but acknowledges this is his dearest dream: “She did save me … but Mother, I daren’t believe such a woman could care for me,” he says with the barest, nakedest of emotions. Within a few moments he will wrap himself up to propose to her — and then, rejected, he leaves the Hales’ but forgets his gloves (and what a classic Freudian move — signaling by those abandoned gloves how much he had hoped to remain there with a different narrative) — but in this moment with his mother, we see for the first time the open-hearted, open-throated Thornton, ready at last to acknowledge his feelings. Thornton: No. No thanks. I did not do anything for you. Do you not realize the risk you’ve taken, being so indiscreet? Have you no explanation for your behavior, that night at the station? You must imagine what I must think. 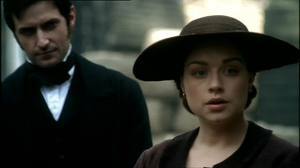 Margaret: Mr. Thornton, please. 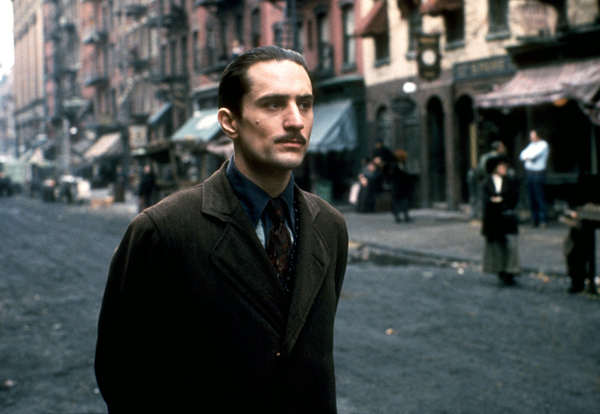 I’m aware of what you must think of me — I know how it must have appeared, being with a stranger so late at night. 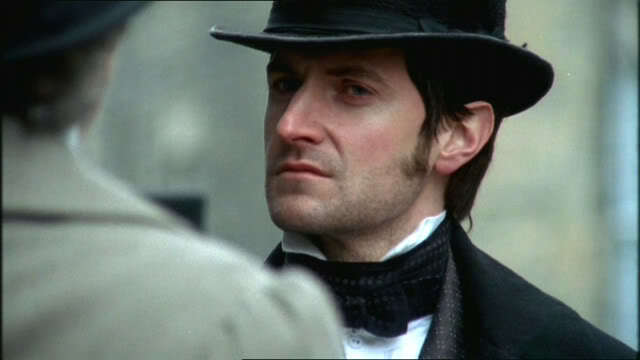 The man you saw me with, he — [she shakes her head, hopelessly]. The secret is another person’s — I cannot explain without doing him harm. 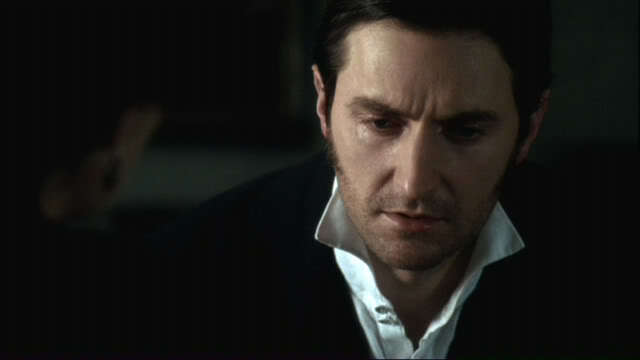 Thornton: I have not the slightest wish to pry into the gentleman’s secrets. My only concern is as your father’s friend. I hope you realize that any foolish passion for you on my part is entirely over. I’m looking to the future. Margaret: And all the time, there she is, looking down on us like a great black angry crow guarding the nest! As if I would ever consider her son as a suitor. Bessie: C’mon, don’t say you haven’t thought about it. — Mind you, you’d have to get some smarter clothes if you want to mix in at Marlborough Mills. Margaret: Thank you! I’ll have you know these were new last year! Bessie: You don’t stand a chance. There’s loads o’ girls after him! Margaret: Well they’re welcome to him — with my good wishes. Oh Margaret, how much you have to learn. 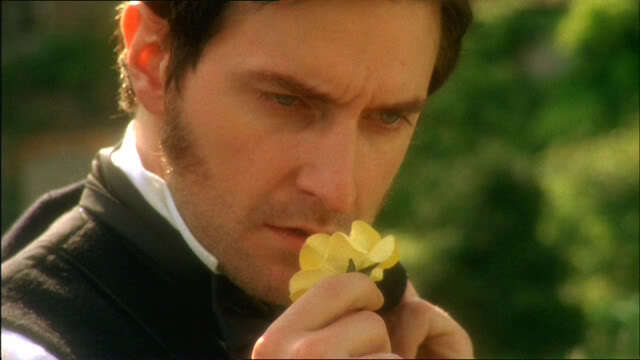 If Victorians spoke an elaborate language of flowers that appears strange to us now, at least us modern viewers can learn — after frequent viewings of four-hour BBC series — can learn to translate the language of men’s clothes as a means of understanding a man’s emotional register. 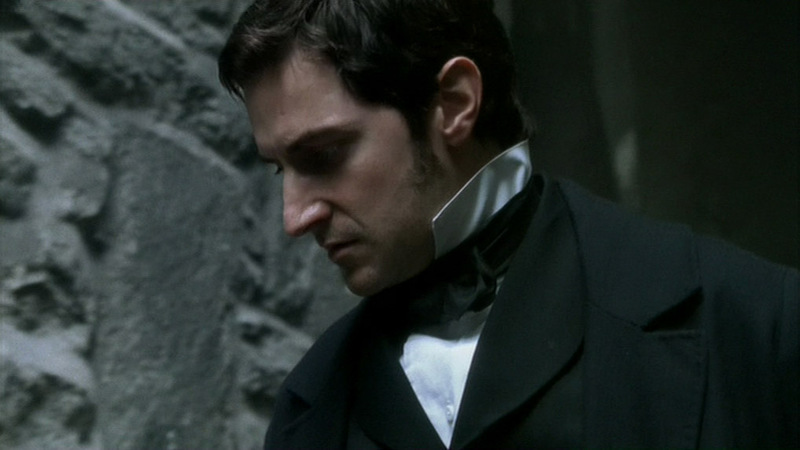 One final note: many thanks to the many Armitage bloggers whose beautiful screen caps helped me decorate this post — I’ve lost track of where I got each one, but I mightily appreciate it. I am in an airport (which I hate) with a delayed flight, observing the array of human folly around me: people barking on cell phones, wailing toddlers, the sickly smell of sweetened pretzels and frustration. George Eliot would have had a field day with this material. 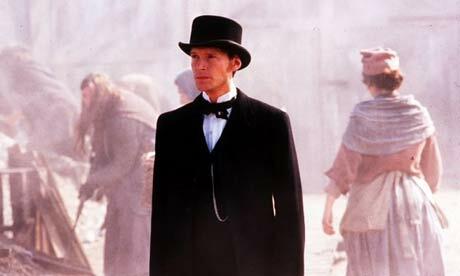 No one ever treated the subject of human folly with such sympathy and wry observation as Eliot’s Middlemarch (1871-72) — as well as in the beautifully staffed 1994 BBC miniseries Middlemarch. (And speaking of folly and pleasure, my Dear Friend came over with beer and cupcakes for viewing last weekend!) In this small midlands town everyone marries the wrong person for the wrong reasons, virtue goes unrewarded, promises of change remain unrealized. Yet it somehow avoids cynicism. Eliot makes us fall in love with these characters and feel for them even when they’re acting stupidly or despicably. That’s why I like the French term, la folie: it signals madness as much as folly, and gets at something more deeply human. 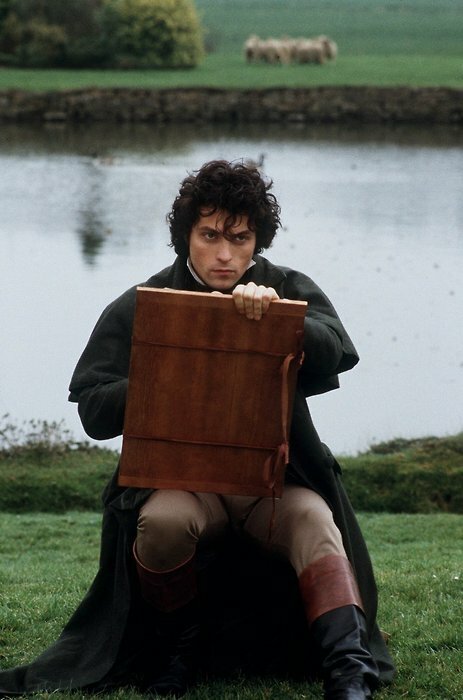 In fact, one can’t look at Rufus Sewell in this series without experiencing one’s own propensity for folly. Sewell is delicious as the dissatisfied Byronic artist Will Ladislaw who takes a turn as a journalist on behalf of parliamentary reform (the story is set in the years before 1832); he gains most of his appeal, however, because he recognizes in his cousin’s lovely wife, Dorothea (Juliet Aubrey), a shared sensibility. They also share a sense of tragedy. Dorothea grew up sheltered but dreams of being truly useful to society, associated with some great work. She’s not in it for the credit. When she meets the aging, dour Casaubon — a scholar hard at work on what he calls A Key to All Mythologies (speaking of folly) — she’s entranced by the possibility of being useful to him, even learning Greek to do so. They marry, a decision that proves almost immediately to be a stupid one, and we watch Dorothea’s hopeful face turn dark and disappointed. 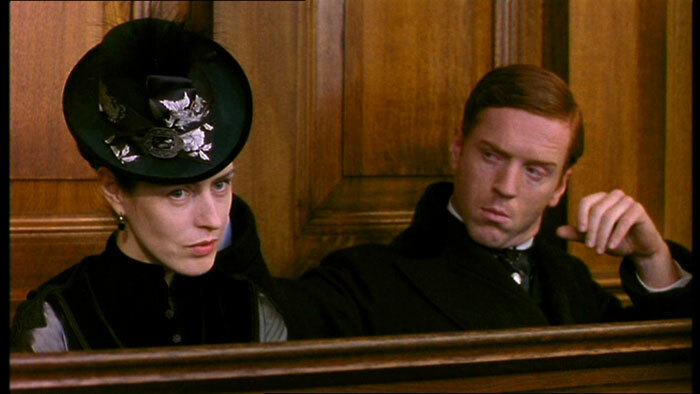 The inhabitants of Middlemarch are foolish about many things — money, politics — but marriage is the worst. 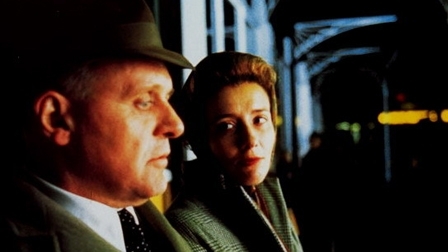 What was Casaubon thinking when he married? 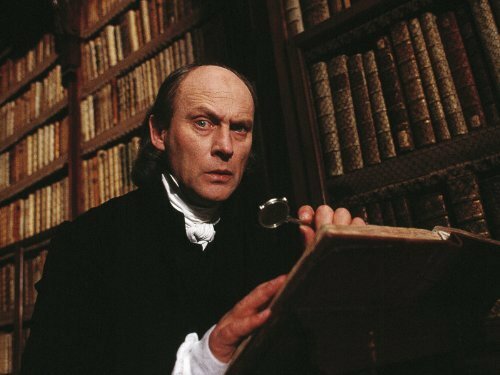 To be sure, Dorothea is pretty and serious, yet he doesn’t really like women or want a wife; perhaps it was the appeal of adding her youthful face to his collection of heavy books in his dreary home. When the dashing but somewhat aimless Ladislaw stumbles across Dorothea on their utterly miserable Roman honeymoon, he forms a bond with her over their shared unhappinesses, not knowing exactly what he wants from her. In Ladislaw’s pursuit of her friendship and trust, he finally has a true goal if not a profession. In marrying Dorothea without any real desire for a true marriage, Casaubon was no less self-aware than the young doctor, Tertius (!) Lydgate, who’s come to Middlemarch with the plan to cure cholera and other fevers at the hospital — and perhaps to get his work on the map of cutting-edge medical research. Buttressed by his ambitions and determination not to earn easy cash by selling quack “strengthening formulas” to little old ladies, he’s doing all his work on a shoestring salary. More fool him that he thinks he can flirt with Rosamond Vincy with no consequences. 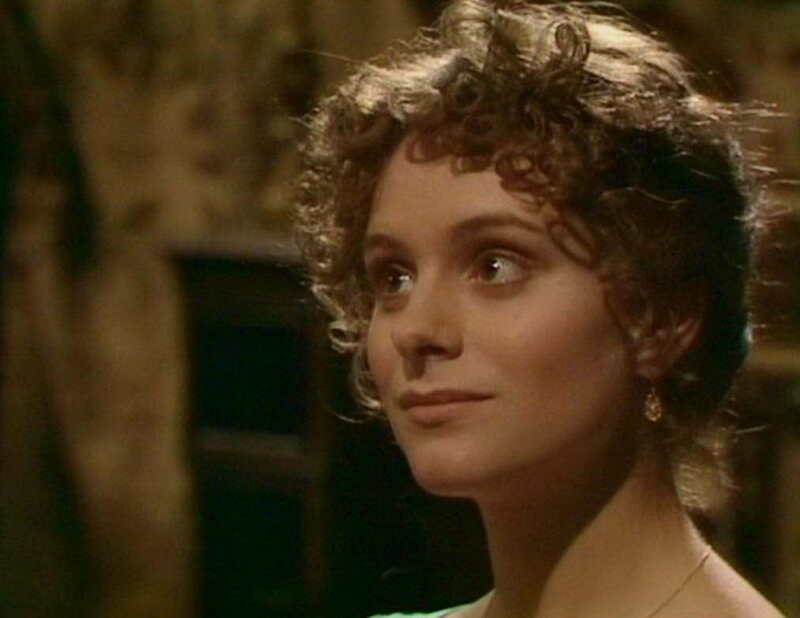 Rosamond knows just enough from her fancy education to disapprove of her parents’ manners and to flirt prettily with the handsome young doctor. 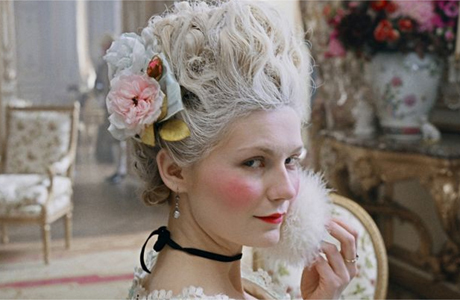 She believes town gossip about the doctor’s family wealth and aristocratic connections, so she flirts with absolute seriousness. The very moment Lydgate pronounces he has no plans to marry, he finds himself caught in Rosamond’s carefully-spun web: she weeps, begs to know what she’s done to lose his affection — so he proposes. Nothing is more depressing — and probably realistic — than Lydgate and Rosamond’s marriage. With her finishing-school training, she knows how to be an ornament to the home and a lively conversationalist, but little else. Her blonde hair twirls and transmogrifies into ever more ridiculous designs, and she still uses her big blue eyes with good effect, but mostly she adds expensive new things to their house and helps to run them deep into debt. When Lydgate tells her of their financial troubles she throws a tantrum, not wanting to know of such things — yet she secretly tries to use her feminine wiles to wheedle cash out of the relations as if she might be a kind of good fairy to her husband. When that plan makes everything worse, she retreats to what she knows: how to be the little girl-child version of a wife she was taught in school. How is it possible that watching people make such bad choices can be enjoyable, especially when they hurt one another so viciously? 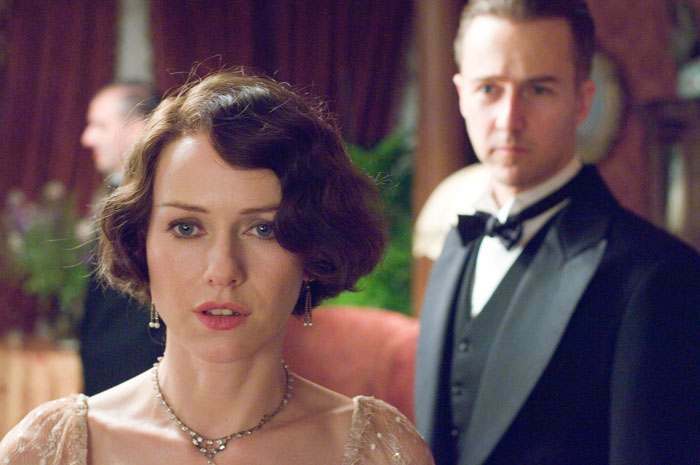 Perhaps it’s Andrew Davies’ streamlined script, which somehow transformed a 900-page novel into a neat six hours of television without using too many over-the-top caricatures. It seems to me that Eliot would be a hard source to translate: her wisest insights about a character or a situation are often revealed in the middle of a dense paragraph of prose. But it’s also the beautiful cast, who embody their characters so perfectly. 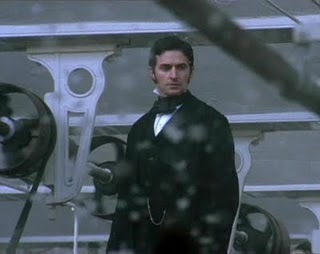 I loved every minute — and while Dear Friend noted that Rufus Sewell does not possess the same acting subtlety and complexity of a Richard Armitage (and she is most surely right), he was perfect for the role, like all the rest of the cast. Most of all, Middlemarch has given me that Eliot-esque perspective and humor for observing the world around me here at the airport. As the crowds stagger by carrying half a house’s worth of carry-on bags and I listen to the constant bleating of the intercom system, I know that Eliot would have refrained from turning sour and cranky — and would have spun it into narrative gold.